Check out how many calories in Grilled Atlantic Salmon. Get answers to all your nutrition facts questions at FitClick. Description: Salmon fillet seasoned and grilled. Tip: For nutritional information on all the ingredients in Grilled Atlantic Salmon just click on each ingredient name. Then adjust the serving size for any Grilled Atlantic Salmon ingredient with the serving size tool in the nutrition facts area to the right to see how you can save calories, carbs and more. Clean and trim salmon. Salt and pepper to taste. Grill salmon on hot grill for 6 minutes per side. 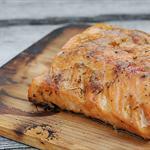 Find more recipes like Grilled Atlantic Salmon. FitClick has over 60,000 foods and recipes with detailed nutrition information to view. I do not like Salmon at all! try Aldi's for wild salmon, a two pound package for around $8. It is in 4 oz. frozen pieces. I put mine in a parchment package with a little EVOO, S & P, onions, peppers, mushrooms, garlic and lemon slices. Bake at 400 degrees for 15-20 minutes. MMMM If you don't have parchment paper you could wrap it in foil. One package for each person. Works for any fish, doesn't dry it out.